Cottage cheese recipes are by far the most favorite especially amongst the vegetarians in Northern India. Cottage cheese or paneer is a ingredient which is used in almost any dish. Sometimes it is used to just garnish as well. So be it palak paneer, mutter paneer, shahi paneer, paneer makhani, methi paneer, paneer parantha, paneer pakora, paneer pulao...(the list is endless), cottage cheese is an essential ingredient. In Northern India you get big blocks of fresh paneer in all the sweet selling shops (mithai ki dukaan). You can also buy packed paneer in supermarkets. The best is that you can make cottage cheese at home as well. Once you know how to make this, you can make all the cottage cheese recipes easily. How to make cottage cheese at home? 1) Take a liter of milk (full fat or toned) and bring it to a boil. 2) To this add about 3-4 tbsp of vinegar mixed in equal amount of water, slowly. (You can use lime juice or even yogurt for the same purpose). 3) When the milk begins to curdle do not add any more vinegar. 4) Simmer for a minute and when the water (whey) separated from the milk turns sea green turn the heat off. That's when you know the paneer is made. 5) Line a colander with a muslin cloth, pour this paneer into this to strain out the water. Wash the paneer under a tap of water (this will stop the cooking process and take off any vinegar smell). 6) Lift the cloth and squeeze out as much water as you can by pressing it with your hands. For making rasgulla please follow the rasgulla link at the end of this page. 7) You will be left with a white ball of soft cheese. You can use this now in crumble form to make some cottage cheese recipes like desserts, salads or paneer bhurji etc or else step 8. 8) Tie it tightly and keep some heavy weight on this. Place it somewhere where the water from it gets easily drained. 9) After 3-4 hours you will have a more solid block of cheese. Keep it in the refrigerator and use as desired. Kindly note:- If you need to store this paneer in the refrigerator for 3-4 days, place in a bowl and cover it up with water and place the lid. This way your paneer will remain fresh for a few days in the refrigerator. Change the water every other day. If you need to freeze the paneer then just shallow fry little cubes of it and let them come to room temperature. Then put them in a freezer box and store for up to 2 months easily (maybe even more but I haven't tried that). Thaw and use as desired. Paneer butter masala or paneer makhani is a mouth watering, cottage cheese recipe. One of my personal favorites, this recipe is very easy to prepare. It is perfect for a formal or informal gathering, liked by adults and children alike. All there is to this recipe is cottage cheese cubes (paneer cubes) in a tangy tomato sauce, flavored with minimum ingredients and finished with fresh cream. Heat oil and butter in a kadai (pan). As soon as the butter melts, add the cloves, cardamoms, caraway seeds, cinnamon and mace. When the cloves crackle add the slit green chilies, followed by the tomato puree. On a high flame cook the tomato puree till the oil oozes out from the sides and it becomes almost dry. At this stage add just a sip of water, cottage cheese cubes, tandoori masala, kasoori methi, salt and color (if using). Cover and simmer for 5 minutes. Turn off the heat and after 5 minutes add the fresh cream and mix. Enjoy with chapati or tandoori roti. Serve a salad or raita on the side. * 200g Paneer cut into 1 cm cubes. * 1/4 cup of fresh green coriander leaves chopped finely. Heat oil in a pan / kadai. Add the cinnamon, cloves, cumin seeds and black cumin seeds. When they sputter add the onions and cook till light brown in color. At this stage add the ginger garlic paste and cook further for 2 minutes (on a low flame). Add the turmeric powder and coriander powder. Cook another minute then add the tomatoes. Cook on a high flame, stirring often until all the tomatoes become mushy and the water dries up. You will be able to see some oil oozing out on the sides of your tomatoes. This is an indication that the masala is cooked properly. Add the green chilies, salt and red chili powder to taste and a cup of water. Bring to a boil and add the peas in it. Cook covered for 5 minutes or until the peas become soft. Sneak a taste and adjust the seasoning. Add the paneer cubes and a pinch of sugar. Also add the milk and simmer for about 5 minutes. 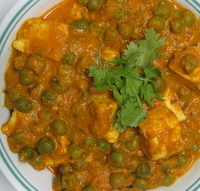 Yummy matar paneer is ready to be eaten with hot chapati. Heat oil in a pan and add onion. Saute till onions become soft, then add the ginger garlic paste. Saute for 2 more minutes. Now add the tomatoes, green chilies and all the powders. Cook nicely till the oil is seen on the sides. It is best to use a non stick pan or kadai for this, otherwise you will have to use more oil initially. Add the crumbled paneer and cook on a high flame till no extra water remains and the paneer absorbs the flavors. Lastly, garnish with fresh chopped coriander leaves and serve hot. You can enjoy this with chapati or bread. Here are some more cottage cheese recipes that you will definitely enjoy.